You join me today soon after completion of one of my proudest baking feats yet. This is a cake that begs you to love it, or at the very least to take it to bed and emerge in the morning covered in buttercream and regret. And then, when you remember that snatched night, when you stuffed yourself stupid, you will sigh wistfully and look into the distance, remembering your forbidden feast. Yes, I agree, I'll dispense with the overstretched metaphors. For now. Now, apart from the fact that it looks rather tricky, the problem with making this cake is that all the ingredients listed were things I'm fairly sure you can only buy in America or over the internet. 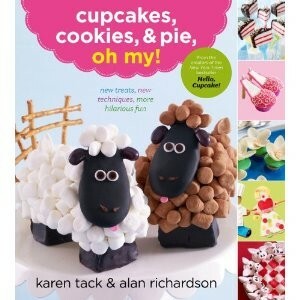 This is not a book that tells you how to make cake and make icing. It tells you how to buy frozen pound cake, cut it into slices and cover them in canned frosting and marshmallows. I have no idea where I would buy canned frosting. So, I decided to make it all myself. How hard could it be, right? I also decided to omit the marshmallows in favour of buttercream, which would make the sheep look all fluffy. So, here is a step by step guide of how I did it. 1. Cut off the ends and cut the rest of the cake into 6-7 thick slices, at least 1 inch each. Then carefully remove a square section from the centre of the bottom of each slice. Put these aside, you will use them later. Tidy up your slices by trimming any rough bits and brushing away loose crumbs. As you can see by the lined tops of my slices, I rested the cake upside down on a cooling rack whilst still warm. Do not do this. 2. Melt 200g of chocolate cake covering in a bowl over a saucepan of hot (not boiling!) water. Then coat the sheepy legs in chocolate by using a knife to spread and a teaspoon to drizzle. Do not dip directly into the chocolate, you do not want crumbs in it. Let any excess drip back into the bowl, then transfer to the plate/cake board you are serving on and press down gently, so that when the chocolate sets it will anchor the cake to the plate, thus preventing tragic tumbling cake incidents. Don't worry if the chocolate drips a bit and looks a bit messy, you can trim off any excess with a knife when it is set and wipe the plate or board clean with damp kitchen roll. 3. Chop the points off the white chocolate chips and drip a tiny blob of the chocolate cake covering on top of each one. This will be the pupil of your sheep's eye. If you don't want it to look crazed you may have to go through LOTS of chocolate chips before you get as many pairs of eyes as you need. Chill out, eat the messy ones. 4. Dip the biscuits in the chocolate cake covering, shaking off any excess then rest somewhere to set. Try to ensure as little of the biscuit as possible is touching another surface - I balanced them on the side of a lunchbox. When the chocolate starts to set, but before it is completely set, put the eyes on, pressing them down slightly to ensure they stay put. The googly eyes are so cute. 5. Separate the buttercream into 2 halves, then take a little bit from each one, just enough to cover the squares of cake you cut from the slices at the beginning. Set this aside. To one of the bigger amounts add 1 ½ teaspoons of vanilla extract. To the other half, add enough cocoa to turn it brown, but still light coloured enough for the biscuit face to stand out against it. Put the white buttercream in a icing bag with a 1M metal star shaped nozzle (if you have one, if not either use a plastic star shaped nozzle or just cut the end of the icing bag off, leaving a 1cm wide opening). Pipe a layer of small peaks over half the cake slices. Then put the biscuit faces on at about a 45 degree angle. Pipe some little peaks above the eyes to weigh it down but leave space to do ears later. 6. Continue adding icing, rounding your sheep out so they don't look so rectangular. Then swap to the chocolate icing and repeat the process with the remaining sheep. When you have covered them, add enough cocoa to turn the icing as dark as the chocolate faces and legs. Then add peaks on the side of the faces for ears. 7. To the small amount of icing you set aside earlier add green food colouring and ½ tsp of peppermint flavouring. Cover the little cake squares, spreading the icing with a knife. You now have squares of grass. 8. Melt the white chocolate in the same way you melted the cake covering, then put it in an icing bag, cut about a 1cm opening off and pipe two lines close together and one crossing them. Pipe over them again to make the chocolate a little thicker. Do this a few times so that if a few break you'll still have enough - these will be your white picket fences. Cut a little slit in the top of each green square, and press the fence down inside so it sticks and stands upright. For the final touch, dot a little cocoa icing on the grass squares and fences - authentic, delicious mud. Ahem, excuse my terrible pun. I can't help it, it's like an illness. I doubt you'll make these. But if you do please remember me and post a link to my blog. Fabulous cake! Too adorable to eat.yet somehow I'm sure you overcame that problem.best of Luck applying for the bake off, really enjoyed this years series, though I have to agree that Paul is a bit meaner this time round.he and Mary are doing the good cop bad cop routine very well. Thanks, glad you liked it! Yes we did manage to force it into our mouths somehow!